People have been bleating on about Learning and Development. Back when this wolf first cut his teeth, L&D stood for lung disease and desperation. Personally I’ve not been anywhere near an induction day in years. So I wouldn’t have a clue what they’re teaching you now. I’d imagine it’s mostly memes about candidates going AWOL, delivered to your watch. Or gifs. Who doesn’t like gifs? Perfect for anyone you know who’s new to this fair industry, Or anyone who’s forgotten the rules of recruitment over the festive break. This is a strange expression in many respects. Because you’d assume at some point, someone did it. And thus the phrase was born. Nonetheless, whilst this always seems like a good idea, it rarely is. Something you’ll have no doubt noticed on entering the world of recruitment is that, aesthetically speaking, the overall calibre of your colleagues is a cut above, compared to most lines of work. I didn’t write the rules. But I do abide by them. So let me be the first to say this… only sh*t where you eat, if you’re prepared to look at that sh*t for the rest of your tenure. To make friends with it. Cherish its aroma. Introduce it to fellow newbies and exchange pleasantries daily. The ball’s your sales pitch. The rim’s the gatekeeper. And you’re the sad little idiot with no friends on the skateboard, trying to look cool on a selfie video you’ll play back later. To yourself. And if we’re going the whole hog, the skateboard’s a physical manifestation of berocca, espresso pods, paracetamol and tears in the toilet. Because they’re the main things keeping you going in this job. To begin with, you’ll take knocks like this poor little lamb with a wry smile and a wince of acceptance. But after a while when even the office dog won’t play with you, you’ll realise you’re in this alone. Totally alone. Well, apart from your videos. No one can take those away. Can they chap? I’ve made plenty of pals in my years in recruitment. And I can always rely on them to let me down when it matters. Any colleagues with a brain will smell a business going sour like a fart in a lift. And they’re usually on the first chopper out of ‘Nam before you can schedule a biannual catch up that neither of you have any intention of attending. My advice? Do one of two things. i) Leave your job at the first sign of trouble (anything from someone shouting a KPI to Accounts answering back) – meaning you’re never left behind. ii) Only hang out with morons. They’ll be none the wiser anytime they’re getting shafted, and you’ll have friends for life. Every office has one, if you don’t know who it is… it’s you. I’d say don’t let the revolving door hit you on the way out. But we both know I’m going to be stood there spinning it like my 2 year old d*ckhead nephew just stepped onto a merry-go-round, whilst his mother took an important work call. You’ll come up against a plethora of tw*ts in your recruitment career. Most of them on the other end of the phone. But if you find one in your office call it early. ‘Out’ them to colleagues and be the first on the gravy train. Or… 3) neither of those things and you’ve made a life long enemy. Recruiters come under fire for being dead behind the eyes, unsympathetic husks of meat. Monstrous individuals who treat people as revenue streams. This is all patently untrue of course. Everyone knows it’s only sh*t recruiters this applies to. So when you start out it’ll take a good 2 or 3 years to reach those lofty heights of emotional indifference. If you’ve applied everything I’ve told you so far, you won’t be far off your maiden placement. And when it comes, you’re going to feel like you won the lottery. A comparatively minuscule, much harder to participate in, extremely fleeting lottery. But a lottery nonetheless. NB: You haven’t won the lottery, and that ‘cracking deal’ everyone’s been delighted to congratulate you on WILL FALL OUT. It will. Somehow, it just will. Look at you. Busting moves like a British Prime Minister as you mince over to the deal bell. Bell being the operative word. Look. I’m not trying to piss in your protein shake. Splitting a £6K fee on your first deal is definitely worth wiggling across the sales floor like a petrified mannequin that’s come to life and is learning how to do the worm, from a book. But just remember, when this deal falls out… and it will… you’re going to have to look these people in the eye. You’ll have noticed I’m on a mission to keep you as grounded as possible. And by “grounded” I mean feeling like you’d actually enjoy digging your own grave before having a nice long rest. That’s because recruitment’s full of ups and downs. And if there’s one piece of genuine advice I can give you it’s to hope for the best but prepare for the worst. Because it doesn’t matter whether the cup’s half empty or half full. Or full to the brim of tears, collected from your chin as you fight yet another counter offer. Depending on the kind of company you’ve joined, you could be walking into a 24 hour beer test. What invariably starts as a couple of cans over a lively game of ping pong can without warning descend into an all-night search for your dignity. You won’t find it in McDonald’s, but that’s where you’ll end up. And before long, you’re putting the ‘fun’ in ‘functioning alcoholic’ and your heart’s pumping a 50% alcohol/blood cocktail through your quivering veins. If there’s a KPI for making it in recruitment, this is it. NEVER, in the history of ‘five minute chats’ has there been a need for a boardroom, or you to ‘take your things’. If you hear those words, you’ve not followed the rules above and are about to be managed out. Good luck in life. And don’t expect a hand shake or even glance from your colleagues. They’re more embarrassed than you. Enjoy your time in recruitment. You poor, deluded fools. What Does “Industry Leading” L&D Mean? 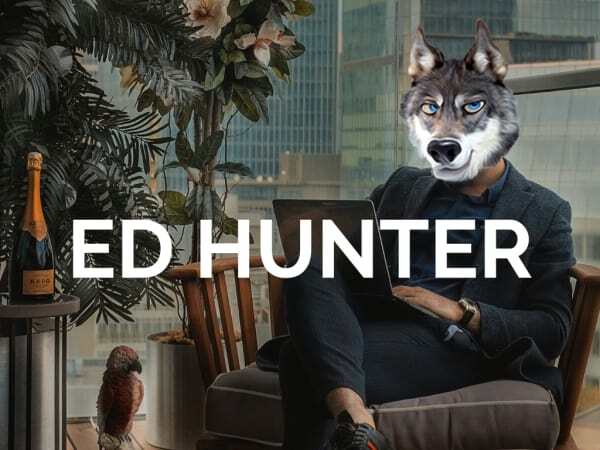 Ed Hunter: Who Wants To Be a Recruiter?